It happens on every layout at one point or another. You have a fantastic track plan. 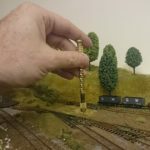 You’ve laid the track, ballasted it and even got some scenery in place. It looks great. 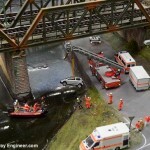 Perhaps you’re realised a stretch of track and a station is needed… Or maybe an extra siding would be useful? Whatever the reason just about every layout gets changed at some point and this usually involves altering the existing track. But how do you remove and replace already laid track? Well, you could go all medieval on your railway. Forcing a flat head screwdriver under the sleepers and prise a section up until you have enough leeway to twist and bend the rails and they ping out of the joiners connecting to the rest of the track. You could, but I wouldn’t recommend it. That’s the quickest way to damaged track. It’s simply not an option if you want to reuse the track. I was faced with exactly this conundrum the other day. My layout consists of sections that I’m building and then fit together. I wanted to change the track at the end of one board from a straight to a curve so it would meet the track on another board being added at a right angle. As said, I could have done the brutal way and levered it up with a screwdriver and then twisted it to free it from the track joiner but there’s a much easier, gentler option. Using a Dremel and cutting disc, cut through the rail joiners connecting the track section you want to remove. 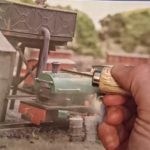 The Dremel is one of my most used tools on my railway and this is one of the many things that it can do, transforming an otherwise fiddly project into a quick, easy, operation. 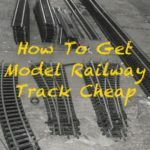 Now assuming you have glued the track down — as many people do — spray warm water over the track to loosen the glue and ballast. Let this work in for about an hour. With the rails free at one end and the glue/ballast softened lifting the track should be easy. Obviously, if you’ve just used track pins and not glue; just lift these out with a pair of needle nose pliers. Now just wiggle off the remains of the rail joiners from the rail ends and drop in the new track. 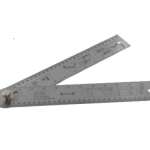 If you struggle with fitting joiners, read this tip on making a tool easily fix rail joiners to existing track. 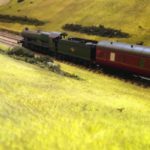 There’s a handy video by Everard Junction that includes a visual demonstration of the technique on his OO gauge layout for those that prefer video guides. Hope this helps. If there are any other track work problems you’re struggling with drop me a line and I’ll be happy to cover them here. The Dremel 3000 is usually available on offer here. Hi Philip, they can be levered if careful. Alternatively, connect wires to the new section, drop it into place and then secure it in place but without joiners. 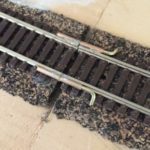 You don’t need to use joiners if the new section has its own power feed and it’s carefully aligned before fixing – perhaps with a bit of solder to keep them aligned but use a small tip to aovid melting the sleepers. I cut back another sleeper in from the end of the rail, you can then push the rail joiner right onto the rail, so that hardly any is protruding. Then line the new rail up, and with the aid of a pair of pliers, gently work the rail joiner back to its normal position. 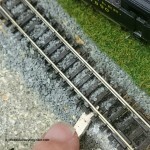 Make the ballast damp, and obviously remove any pins, and you will find the track quite easy to remove; hopefully the rails will be reusable, but sometimes you may find that you’ll have to replace the track with new, at least a length of flexible Peco track is not too expensive! That’s pretty much what the articles says Different way of applying the getting the ballast damp but same general technique.